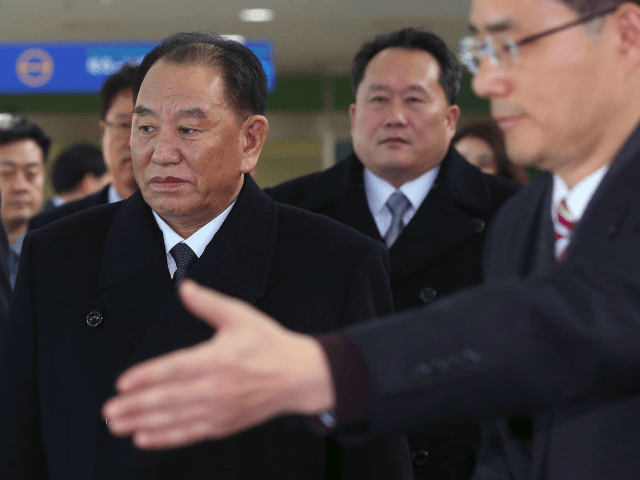 Senior North Korean official Kim Yong-chol, the second-in-command in the ruling communist Workers’ Party, reportedly landed in Washington, D.C., Thursday for talks with Secretary of State Mike Pompeo. Several reports suggest Kim may meet with President Donald Trump and may be carrying a letter from dictator Kim Jong-un. Sanctions ban Kim Yong-chol, along with most of North Korea’s senior leadership, from entering the United States. Yet he has made several visits to the country for fine dining events with the State Department and meetings with senior American officials. Most recently, he brought Trump a letter from Kim Jong-un to the White House in June, prior to the first summit between the president and the tyrannical cult leader. South Korea’s JoongAng Ilbo reported Friday that Kim Yong-chol is expected to discuss the logistics of securing a second summit between Kim Jong-un and Trump early this year. He is scheduled to stay in the United States for three days. Pompeo had previously scheduled talks with Kim in November, though both sides canceled that meeting. Yonhap, another South Korean outlet, also reported that Kim landed in Washington on Thursday and witnesses had spotted him about town. Kim reportedly flew directly into Washington, D.C., an unprecedented move for a North Korean official. The stop suggests the government has once again offered him a sanctions waiver in the interest of continuing nuclear weapons talks. Yonhap calls it “likely” that Kim will meet with Trump, as well.